From left to right, the Parker Ballistic Extreme 275 grain, the Hornady 300 grain XTP, and the radical new Parker 325 grain Parker 325 Match/Hunter. Parker Productions is the manufacturer of Parker bullets, located in Troy, Idaho. Bob Parker developed his Hydra-Con back in 1989. For some western states such as Colorado and Oregon, sabots are not allowed for no logical reason giving rise to such terms as the Colorado Conical. Nevertheless, conicals must be used and then there have been further restrictions on length, in some cases. If you are planning to hunt a conical state, Parker Productions is your ticket to ride. There is demand for inlines that can be used under these situations. Thompson offers the Northwest Explorer, an exposed breech, #11 percussion cap ignition, 1:48 rate of twist barreled version of their immensely popular Omega. The Knight Rifles name is back as a new company and they have announced they will be shipping the Knight Bighorn in both .50 caliber, 1:28 rate of twist, and .52 caliber 1:26 rate of twist configurations this spring. The Bighorn offers the versatility of #11 cap, musket cap, or 209 ignition. The eternally popular conical inline, the "White Super 91" and White 98, can still be found directly from Doc White from time to time as well as other sources. The James Whitworth inspired Whites feature 1:20 rate of twist barrels in .451 caliber and 1:24 rate of twist in the .504 versions. Parker can supply you with appropriate conicals for any of these rifles, just as they have been doing for years. The matter at hand, though, is the latest and greatest from Parker: apparently the highest ballistic coefficient muzzleloading projectile ever released. Many of you are familiar with the .018 in. thick jacket Parker Ballistic Extreme saboted projectiles, offered in 250 grain and 275 grain versions. These have been the most popular of the Parker bullets for some time. The 275 grain Ballistic Extreme will be tested when the weather allows it in at least two of my regular test rifles, the Savage 10ML-II and the T/C Encore. The Parker 325 features a .028 in. jacket, designed to handle higher impact velocities, tougher game, or a bit of both than thinner jacketed bullets allow for. The big news from Bob Parker is this hand-crafted 325 grain .45 caliber Parker 325 Match/Hunter. And, extreme it certainly is with an eye-popping G1 ballistic coefficient of .430 printed right on the label. The Parker 325 Match/HunterIt is an aggressively profiled bullet, designed to cheat the wind as much as possible. My understanding is that this Parker 325 has a .028 in. jacket, making it more suitable for both high impact velocities and breaking bones. The general standard in the industry has been the .50 caliber inline for many years. It currently offers the widest variety of bullet and sabot choices by a huge margin compared to other bores. As a generality, getting away from bore size for the same grain weight and profile of bullet offers external ballistics and better sectional density, the better sectional density meaning better penetration as a generalization. .45 caliber ballistics beat .50 caliber ballistics handily, so if possible it is a very easy choice to make. 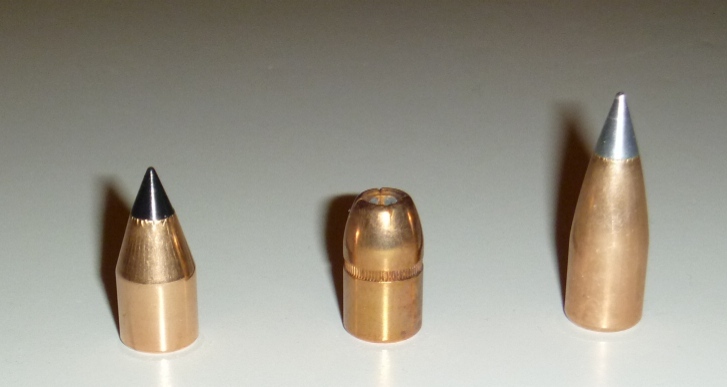 Along these lines, many have asked, So why not a .40? Sure, the same comparison applies on the same basis, but .40 caliber bullets in 50 caliber sabots are often temperamental, although there are exceptions. The thinner the sabot, the prone the bullet is to canting or cocking upon loading and often the thinner the sabot the cleaner release of the of the bullet from the sabot at the muzzle. These are trends, of course, not absolutes. The 300 grain Hornady XTP, centered in the above picture, has a very good track record in offering good terminal performance on whitetail. 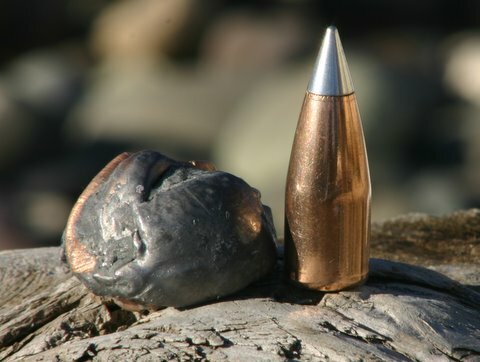 It is a .452 diameter bullet, a hollow point, sectional density of .210, with a published static B.C. of .180 by Hornady. The hollow point doesn't help the flight characteristics, not does the cannelure on the jacket that tends to disrupt airflow compared to a smooth jacketed bullet. The cannelure, the french term for ring-like groove serves as a place to crimp brass onto a bullet, but serves no use in a saboted muzzleloading application. Ballistic coefficients constantly vary in concert with velocity, range, and ambient conditions. It isn't an exact number, the Ingalls methodology has its issues. Sierra, for example, publishes multiple ballistic coefficients for most of their bullets in an attempt to compensate for the flaws in the Ingalls drag functions. Modern exterior ballistics has largely obsoleted drag coefficients altogether with Doppler radar ranges that allow precise projectile plotting. Nevertheless, B.C. 's are still used in the sporting world. Some folks have asked what the benefit of a higher drag coefficient is at short ranges. The answer is, not much, within reason. The worst flying projectile of all is the round ball, shedding velocity ridiculously fast. Small wonder .36 and .40 caliber roundball rifles are called Squirrel Guns. Roundballs also have the worst sectional density of any projectile and penetrate the least. The conical bullet, historically, in the form of the Capt. John Norton (1823) / William Greener (1836) / Capt. Claude Étienne Minié ball was the most devastating improvement in small arms to that point, culminating in the American Civil War where about 90% of the casualties were attributed to the Minie ball. The conical has been the worldwide standard ever since, naturally with further enhancements. Downrange though, a better flying bullet makes a huge difference. Less velocity erosion, less wind drift, higher impact velocities, better tissue disruption, and better penetration capabilities all due to the higher impact velocities. Let's take a look how at how the 300 grain XTP compares to the Parker 325, assuming the identical launch velocity of 2200 fps. Since I've not had the chance to shoot Bob's new 325 through a pair of chronographs simultaneously yet to get my own shooting B.C., I'll use a more conservative than already estimated static B.C. (.430) for the Parker 325 at .400 for comparative purposes. The Parker 325 Match/Hunter, uppermost graph, is compared to the 300 grain Hornady XTP directly beneath it, assuming the identical muzzle velocity of 2200 fps. Now you can see why Bob Parker is so excited. It could be that he had the Packers and the Over? Maybe, I don't know, but it is more likely this bullet. At 300 yards, you have an extra 484 fps on target, with more than twice the energy . . . over 1000 foot pounds more. In terms of six inch kill, maximum point black range it is center of the body hold to 220 yards and go pick him up. Energy fans will note that the Parker 325 retains 1000 fpe to past 650 yards. I'm not nearly clever enough to just look at a bullet and predict a group size. So, the Parker 325 will get a good work-out with a Savage 10ML-II and a T/C Pro Hunter for starters. Speaking of starters, there is just one tiny consideration with the Parker 325. How do I load the darn thing? The "from the muzzle part" I've got, that's from years of practice and self-denial, but this extreme has an extremely pointy nose, so pointy that my trusty Spinjags that load everything else will not accommodate it. My understanding is that Phil and the folks from Gunn Innovations, the Spinjag people, already have a spinjag especially designed for this bullet. The Parker bullets are .450 in diameter. This is important when considering muzzleloading standards, primarily because there are no muzzleloading standards. Hornady bullets are .452, Sierra often runs .4515, Barnes bullets are in the .451 area. Bob's bullets are two thousandths less. The bullet "standards" are far closer than different manufacturer's interpretations of .50 caliber, to say the least. This means that when using the classic MMP short black sabot from Del Ramsey, though an XTP might be excessively tight, a Parker 275 BE or this Parker 325 will be a bit easier and smoother in the same barrel. As it happens the short black MMP sabot is generally the sabot of choice for this bullet. So, for now, for more info on the Parker 325 get a hold of Parker Productions at http://parkerproductionsinc.com . Spinjag is at http://www.spinjag.com, as always, and MMP sabots can be found right here: http://www.mmpsabots.com. I believe Bob is going to supply these with or without sabots as you prefer, but you're better off double-checking with Parker Productions on that.